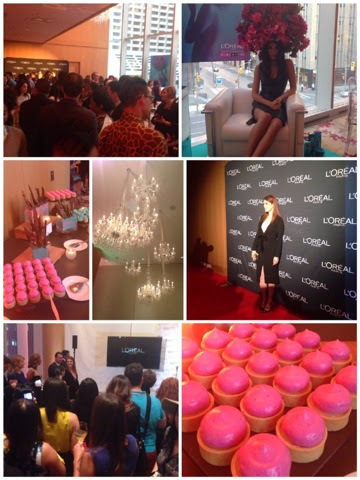 Monday night, I attended an exclusive L'Oreal event hosted with the lovely L'Oreal brand ambassador Julianne Moore. Like all L'Oreal events, we were treated VIP style with amazing hors d'oeuvres and cocktails. The room was buzzing with beauty bloggers, fashion and beauty editors, media and always lovely L'Oreal staff and PR staff. The room had a mini red carpet on one end and a podium on the other where Julianne Moore spoke so beautifully about her L'Oreal partnership. Ms. Moore is so articulate and so charming that you can listen to her speak for hours. Honestly, this women is flawless, beautiful, gorgeous, hot, elegant, classy and genuine. 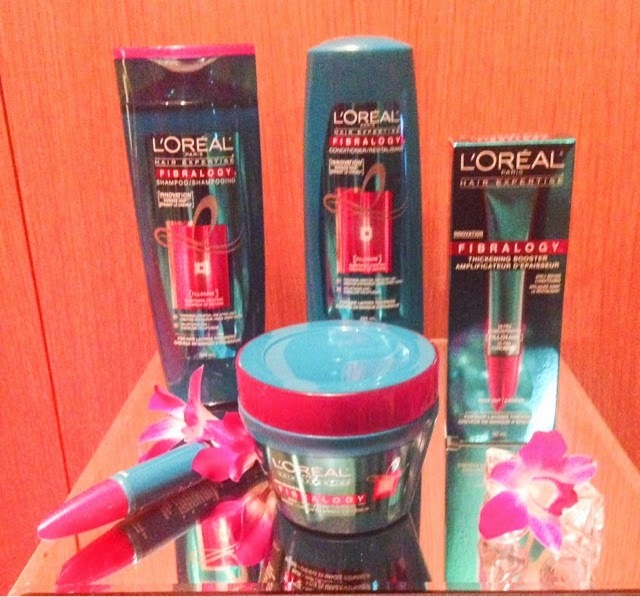 The other star of the night was the new L'Oreal Paris hair expertise line FIBRALOGY. The four product FIBRALOGY line will be available January 2015 and it's a first in its kind and took 17 years of research and eight years of testing..
FIBRALOGY is the first haircare line in L'Oreal Paris' already extensive hair care products that contains L'Oreal's patented Filloxane. a multi-talented active ingredient that deeply penetrates the hair fibre and expands it adding volume and body. A molecule that has the ability to switch from a liquid state to a solid state. Adds substance to thin hair by acting as a filler to expand the hair by achieve volume and body within the hair fiber. Long lasting action, remains inside the hair fiber for up to 10 shampoos. The FIBRALOGY line consist of Shampoo, conditioner, a mask and a thickness booster treatment. A full product review will be up after testing, I, fortunately, have an abundance of hair which is extremely thick and so, I have recruited my SDM Manager Michelle to test these out for me.